This data set provides atmospheric carbon dioxide (CO2), methane (CH4), and carbon monoxide (CO) concentrations from airborne campaigns over the Alaskan and Canadian arctic for the Carbon in Arctic Reservoirs Vulnerability Experiment (CARVE). The data were collected in situ using a four-species cavity ring-down spectrometer system (CRDS; Picarro Inc.) provided by Harvard University and are presented at 5-second intervals throughout each flight. The Harvard CRDS instrument only collected data in 2012-2014; no Harvard data are available for year 2015. Aircraft latitude, longitude, and altitude are also provided. CARVE flight campaigns took place from 2012 to 2015 between the months of March and November to enable investigation of both seasonal and inter-annual variability in atmospheric gas content. The measurements included in this data set are crucial for understanding changes in Arctic carbon cycling and the potential threats posed by thawing of Arctic permafrost. There are 121 data files in netCDF (*.nc) format, one for each CARVE campaign flight in 2012-2014, with this data set. Figure 1. 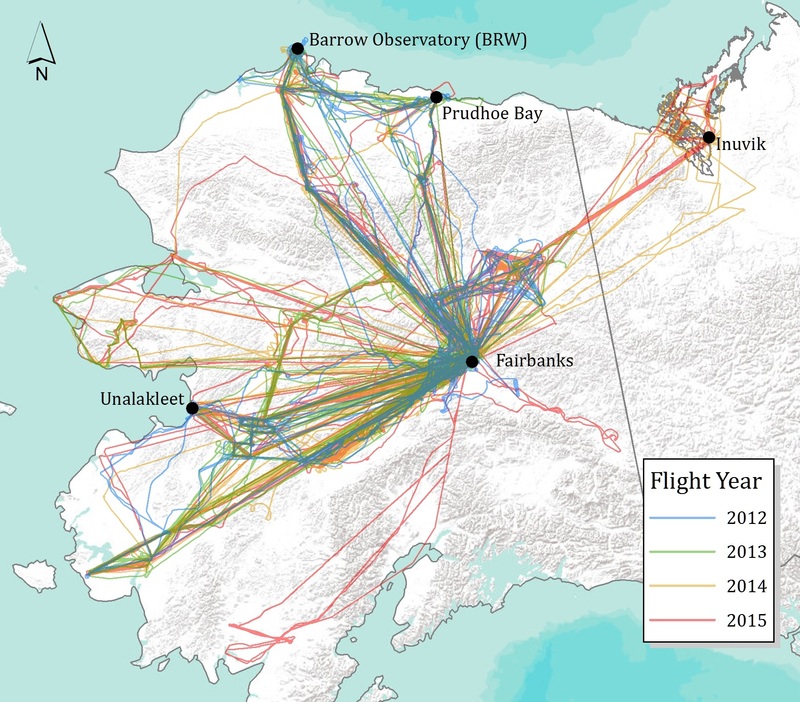 CARVE flights during 2012-2015 delivered atmospheric gas measurements over continuous and discontinuous permafrost regimes. Temporal Coverage: Periodic flights occurred during the growing seasons (approx. March – November) of 2012 through 2014. Temporal Resolution: All measurements were aggregated to 5-second intervals for distribution with this data set. All data are stored in NetCDF (*.nc) version 4 file format. Each file provides measurements of dry mole fractions of atmospheric CO2, CH4, and CO acquired during a single flight. No H2O concentration measurements were made so H2O and the corresponding QC layer contain fill values of 0. Table 2. Data variables in each netCDF file. Fill value or missing data were set to -999.9 for all variables. H2O values were set to 0. * Sample air was dried in two stages prior to measurement, first with a nafion dryer, then followed by a dry ice trap. Hence, no water data are reported for the Harvard University L2 product. This field is included in the data file for consistency with the NOAA CRDS data. CO, CO2, or CH4 mole fractions are above or below the laboratory standards used to calibrate the instrument. Variation in cavity pressure is beyond 139.5-140.5 torr or the cavity temperature is beyond 44.98-45.02 C.
Used to indicate system leaks or calibration problems. For these flight dates, it is recommended to use the merged atmospheric gas data instead. Instrument had not yet equilibrated on 20120724 (DOY=205). Suspected system leak affected CO2 on 20120918 (DOY=261). The wavelength monitor was unstable (April 2013, DOY=91-95), resulting in very noisy data. A new wavelength monitor and lower-vibration inlet valve were installed in time for the first May flight and the remaining data are much less noisy. The calibration system was not enabled until mid-way through the flight on 20130709 (DOY=189). These data were calibrated using the mean calibration for the second half of the flight. Calibration system was not enabled on 20140812 (DOY=223). Calibration applied was the mean of 20140811 and 20140813 calibrations. These data files contain high-frequency atmospheric CO2, CH4, and CO content observations for CARVE flights during March– November of 2012 to 2014. The CARVE project was designed to collect detailed measurements of important greenhouse gases on local to regional scales in the Alaskan arctic and demonstrate new remote sensing and improved modeling capabilities to quantify Arctic carbon fluxes and carbon cycle-climate processes. The CARVE data provide insights into Arctic carbon cycling that may be useful in numerous applications. Continuous measurements from the Harvard CRDS instrument were calibrated against on-board standard gas samples once every 30 minutes by an automated system. This data set includes continuous, in situ measurements from the gas analyzer, a cavity ring-down spectroscopy (CRDS) instrument (Picarro Inc.) used for rapid measurement of trace gas mole fractions (Crosson, 2008). Gas measurements from samples collected with the flask system are distributed as a separate CARVE data set. CRDS is a technique for measuring quantities of gaseous substances based on the rate of light intensity decay following laser illumination of a highly-reflective containment cavity. A CRDS system measures the time constant of decay to 1/e of its initial intensity, its ring-down time, in order to calculate the concentration of the absorbing gas mixture within the cavity. These data were gathered using a four-species CRDS system (Picarro model G2401, SN CFKBDS2010). CO2, CH4, and CO were recorded at 2.5 to 5-second intervals for the duration of each flight, and aggregated to 5-second temporal resolution for distribution in this data set. CO and CH4 dry mole fractions are reported in parts per billion (ppb) and CO2 dry mole fractions in parts per million (ppm). Records with invalid measurements are assigned a default mole fraction (-999.9). Sample air was dried in two stages prior to measurement, first with a nafion dryer, then followed by a dry ice trap. Hence, no water data are reported.